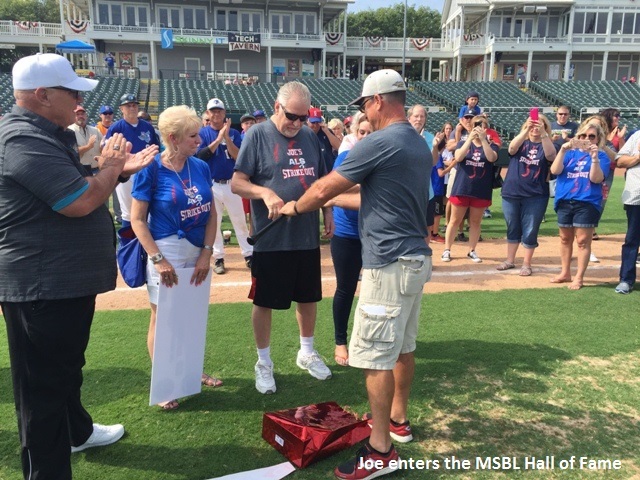 When Joe and I started this discussion I ensured him that this isn’t a ‘woe is me’ article and that we are going to focus on his MSBL achievements throughout the years, which is why MSBL Founder and President Steve Sigler has inducted Joe into the 2017 class of the MSBL National Hall of Fame. So from here forward in this small slice of Joe’s life you will not hear anything more about the 2017 Joe. Let me switch gears and explain why Joe has been inducted. Joe and his wife Connie live in Rockwall, Texas and have been married for 28 years. They have a daughter, Ashley who has been instrumental in coordinating a normal life for dad as well as his biggest cheerleader and fund raiser. Joe is 60 years old and has been working for the same tech company for 21 years and continues to work from home by utilizing a voice activated computer. So what about his baseball roots and how did he become involved with MSBL? So many times we rightfully recognize the players who have excelled on the field or those who have organized busloads of teams to participate in our national tournaments. To honor Joe as a league mechanic and data specialist is a testament to his love of the game and the league without driving in a single run. Congratulations, Joe.